November 03, 2018. Ari Aster and Toni Collette talk about "Hereditary" at the Deadline Contenders Q&A for the film. June 01, 2018. 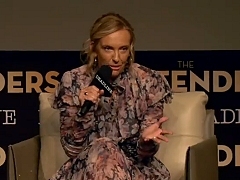 Toni Collette is interviewed at the London Sundance Film Festival's screening of "Hereditary". June 01, 2018. 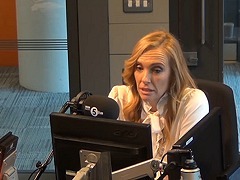 Toni Collette talks to Ben Bailey Smith and Clarisse Loughrey about "Hereditary" during the British promotion for the film. August 02, 2017. Toni Collette is interviewed by the moms of Mamarazzi on "Fun Mom Dinner" and motherhood. January 29, 2016. Toni Collette and Rachel Griffith host the 2016 G'Day USA Gala to honor director George Miller and actor Joel Edgerton. October 27, 2015. Toni Collette and Jaqueline Bisset are interviewed by The Huffington Post to promote the US release of Miss You Already. October 26, 2015. Catherine Hardwicke, Toni Collette and Jaqueline Bisset attend Talks at Google to promote the theatrical release of Miss You Already in the United States. October 25, 2015. Toni Collette is interviewed at the New York screening of Miss You Already. September 30, 2015. Report from the Sydney premiere of Miss You Already, featuring interviews with Toni Collette and Drew Barrymore. September 17, 2015. 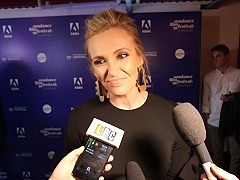 Interview with Toni Collette at the London premiere of Miss You Already. September 12, 2015. Catherine Hardwicke and Toni Collette are interviewed by the Hollywood Reporter at the Toronto Film Festival. September 12, 2015. Toni Collette, Catherine Hardwicke and Morwenna Banks attend the Variety Studio at the Toronto International Film Festival. September 12, 2015. The Wrap interviews Toni Collette, Catherine Hardwicke and Morwenna Banks at the Toronto Film Festival. July 11, 2015. 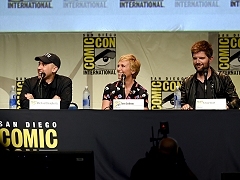 Director Michael Dougherty and actors Adam Scott and Toni Collette attend the Legendary Pictures panel for "Krampus" at the San Diego Comic Con. July 11, 2015. Compilation of interviews with Toni Collette at the photocall of the San Diego's Comic Con presentation of "Krampus". January 2015. 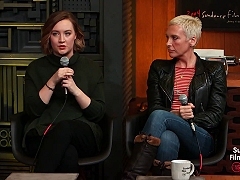 Interview with Toni Collette and Saorise Ronan at the Sundance Film Festival's Times Talks studio. January 2015. 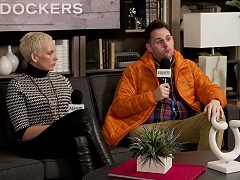 Interview with Toni Collette and Gerard Barrett at the Sundance Film Festival's Variety Studio. January 2015. Scenes and interviews from the premiere of Glassland at the Sundance Film Festival. February 20, 2014. Press Review for "The Realistic Joneses", featuring interviews with Toni Collette, Michael C. Hall, Tracy Letts, Marisa Tomei, Sam Gold and Will Eno. February 2014. Compilation of scenes from the world premiere of A Long Way Down at the Berlin Film Festival. Compilation from the Berlin International Film Festival's press conference of "A Long Way Down", attended by Pierce Brosnan, Toni Collette, Aaron Paul and Imogen Poots. September 08, 2013. Press conference for "Enough Said" at the Toronto Film Festival, featuring Nicole Holofcener, Julia Louis-Dreyfus, Catherine Keener and Toni Collette. September 07, 2013. Report on the TIFF premiere of "Enough Said", featuring interviews with the cast and crew of the film. September 07, 2013. Nicole Holofcener, Julia Louis-Dreyfus, Toni Collette, Tracey Fairaway and Tavi Gevinson speak at the Variety Studio during the 2013 Toronto International Film Festival. June 26, 2013. A panel conversation held by the Wall Street Journal on "The Way, Way Back", featuring Toni Collette, Liam James, Nat Faxon and Jim Rash.